The Yongsan era of the US Forces Korea will draw to a close in the coming months with an official transfer ceremony at an expanded base south of Seoul, defense sources here said Monday. "The USFK headquarters will relocate to Camp Humphreys by June or July. A transfer ceremony is provisionally slated for early July," an informed source told Yonhap News Agency. "No date has been fixed yet, with the USFK leadership currently preoccupied with preparing for the (upcoming) South-North summit talks." Gen. Vincent K. Brooks, commander of the 28,500-strong USFK, also leads the United Nations Command and the allies' Combined Forces Command. The UNC oversees the operation of the Joint Security Area, also known as the truce village of Panmunjom, inside the Demilitarized Zone that bisects the two Koreas, a legacy of the 1950-53 Korean War. It ended with no peace treaty, leaving the two sides technically at war. Panmunjom is the venue for the summit to be held next Friday. It's unprecedented for the leaders of the Koreas to meet there. "A number of USFK service members belong to the UNC. They are focusing on making related preparations," the source said. "They are in close consultations with the South Korean side on the logistical issue." The headquarters of the UNC will move to Humphreys in the western seaport city, approximately 70 kilometers south of the capital, in summer as well, while the CFC is to leave the Yongsan garrison and settle in the Ministry of National Defense compound near the Yongsan facilities. Another source said there's no change in the USFK's plan to wrap up the relocation work by the end of this year. 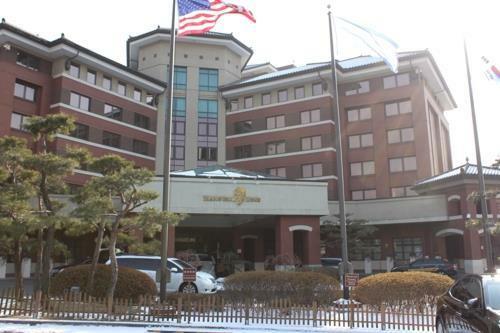 "The USFK will likely vacate the Dragon Hill Lodge hotel in the South Post of the Yongsan base," the source added. South Korea's liberal Moon Jae-in administration wants the USFK to empty the installation despite a 2014 deal between the allies to allow the US to retain some facilities at the base, including the nine-story hotel.